I used to work on Chancery Lane, and whilst there were a few nice places to lunch (I'm looking at you, Vanilla Black and the Chancery), I never got round to going, as I couldn't get anyone to leave their desks for long enough, and frankly dining solo seemed a bit sad in such elevated surroundings. And evenings seemed unattractive, as by then I felt I'd much rather get away from the office and head further into town. Then I fell into a bad crowd - they called themselves the Clerkenwell Lunchers. Their mission - to seek out nice places to eat in and around the Clerkenwell area and to colonise them one by one, by having a proper, sit-down lunch at each of them. Crazy business. Of course, I was in like a shot. We did the rounds in Clerkenwell, visiting Cellar Gascon, Cafe VN, Tohbang, Tajima Tei, Giant Robot, The Gunmakers, Banh Mi Bay. The only problem was that all these places were a bit of a distance from where I was based, so I risked indigestion and a massive stitch in order to scoot back to my desk within the hour. Then one day, a new joint opened in town. From the same stable as Texture, 28-50 Wine Workshop and Kitchen was so close to my office I could be there in a couple of minutes - I could even (whisper it) stroll if I wanted to. Thus, the next time a meet-up was mooted, I practically yelled at people to come to 28-50 with me. My willing victims were the Grubworm and Mr Noodles from Eat Noodles Love Noodles. Of course, then I was late, so when I descended to the basement dining room, past a random collection of miniature globes, my companions were already ensconced in the corner. The decor was very Farrow and Ball - a rustic combo of pastels, unfinished wood and bare brick, but it all worked well. Simple elegance came through with the table settings, and even the menus which had a pretty woodgrain printed onto them. The set lunch for £15 seemed a bargain with no duff choices, so we all went for it happily. 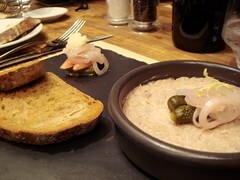 A starter of Duck Rillettes and Toast was spot on, with wonderfully tart, home-pickled cornichons, onions and radishes cutting through the luscious, fatty duck meat. 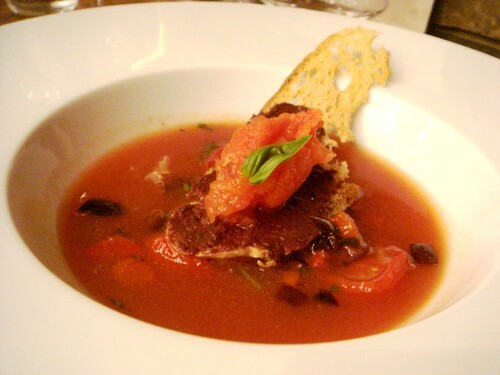 Gazpacho with Tomato Sorbet was also refreshing, with proper tomato flavour coming through. 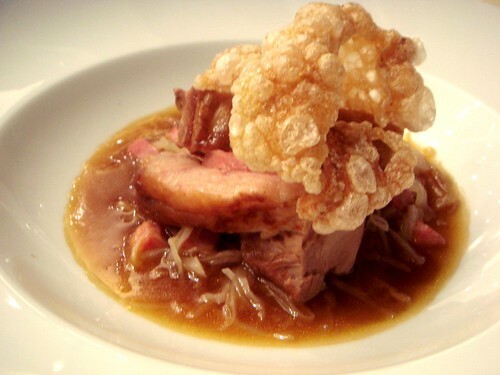 For mains, we all chose Pork Belly with Braised Cabbage which came with a mound of perfectly puffed crackling. Again, I was impressed how the tangy cabbage (like a delicate sauerkraut) contrasted elegantly with the sweet pork, which was almost supernaturally good. It was very clear that those in the kitchen knew exactly how to balance flavours, and I cannot remember the last time I left a place feeling so satisfied. So when it was time for me to move jobs, there was only one place I wanted to go for my leaving lunch, and thus we booked 28-50 forthwith. 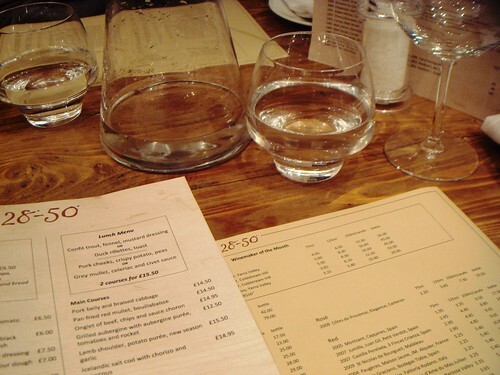 Most of us chose the set menu, which pleasingly had changed from my last visit. 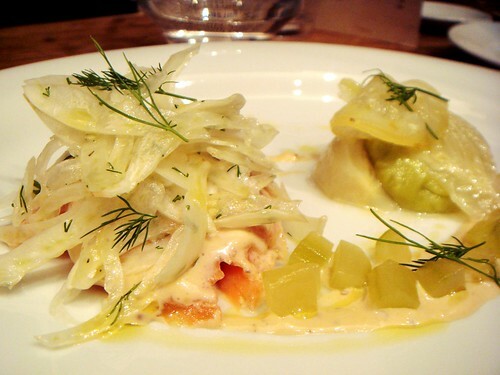 To begin this time, I chose Confit Trout, Fennel, Mustard Dressing; others went for the rillettes, and an ample charcuterie board. Once more, the kitchen showed an assured hand with my starter - the sharp, sweet, and aniseed flavours commingled happily. 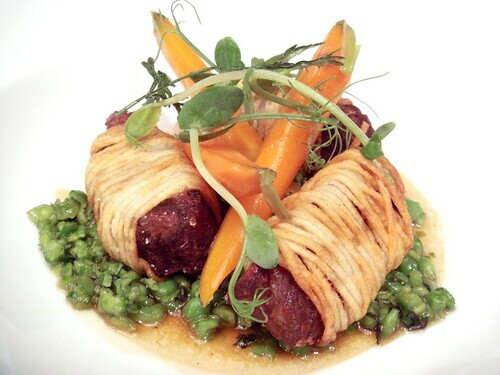 My main was described as Pig Cheeks, Crispy Potato, Peas - such terseness could not convey the true delight. The potato had somehow been whipped into crunchy potato spirals, encasing each tender pig cheek - like a glamorous take on a corn dog. Crushed, minted peas came topped with pea shoot tendrils, and were so sweet and moreish, I could have easily eaten a whole bowl. 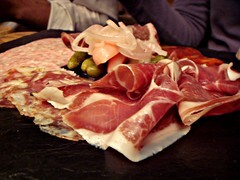 Visually stunning as well as delicious, this ranks as one of my favourite dishes of 2010. Grey mullet, celeriac and civet sauce seemed to make its recipents quietly content, but struck me as bit peculiar; civet is generally a stew of hare, red wine and the hare's blood (compare jugging), so this was basically fish with red wine sauce, which seemed a wrong-headed combo. I believe Gordon Ramsay also serves fish with civet sauce, but that's not really a selling point for me. 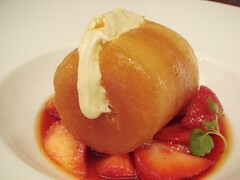 No matter, this mis-step took none of the sheen off for me and it was time for pudding which I'd forgone the last time. I'd seen that they had Rhum Baba, my childhood favourite, so there was no question of me ordering anything else. 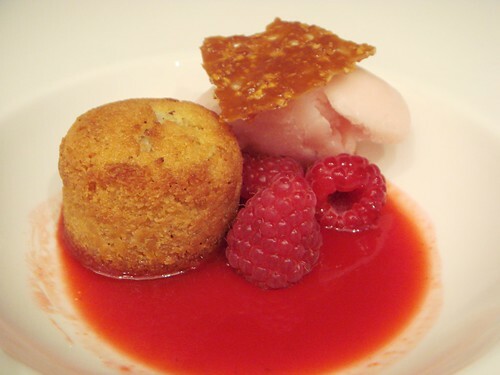 The others ordered Pistachio brulée with cherries and Almond cake with peach sorbet and fresh raspberries. 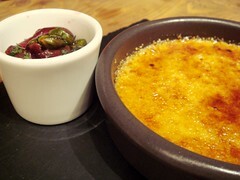 First impressions were not great - the brulée was runny, and the only pistachio element was a sorry cupful on the side. The almond cake was better though, and the peach sorbet seemed to go down a treat. We were completely back on track with the rhum baba though, a handsome cream-stuffed, booze-steeped beast on a bed of macerated strawberries - over which, to my pleasure and slight alarm, the waiter then tipped another small jug of rum. It ticked all my boxes. It flicked all my switches. It got me hammered with one mouthful. "I really love this place", I thought, as I wobbled my way back to my desk for the last time. And in the cold light of day, I stand by this sentiment. I just wish I still worked nearby. 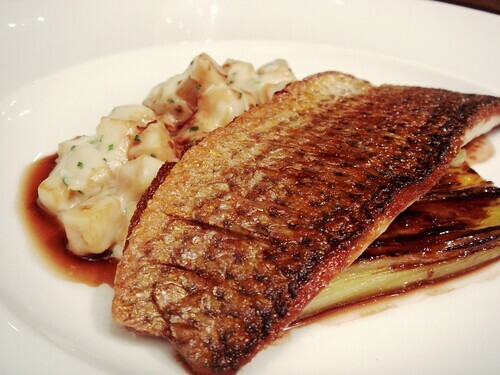 "grey mullet" - is there a less appealing name for a dish?! I've only been here for drinks aplenty, plus nibbles, but I am definitely going to be back to try those pigs cheeks - they look amazing! The staff are really good as well; if you want to try some wine that's a bit different, they will happily advise you. Interesting wine list too. Nice review and glad you liked it. I had my (London) leaving doo there too, and quite enjoyed it. 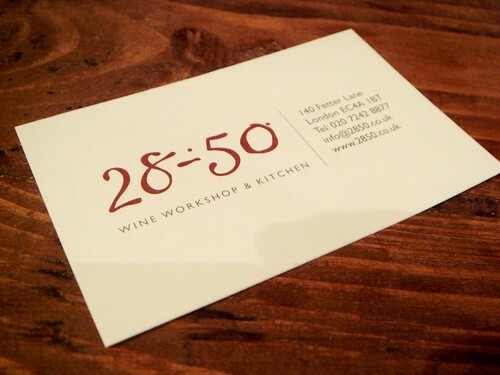 Great little place with a wonderful selection of wine and well executed, straight-forward food. @WalshyMK - I was so distracted by the civet sauce (mmm, musky animals), that I didn't even think about the grey mullet. Yeah, the cheeks were a dream. @Laissez faire - It's a real gem, aside from the odd wobble. That pork belly really was very good indeed. And it looks like their other stuff is pretty fine as well. I particularly liked the fact you could get small (75ml) glasses of wine so you could fit in a couple over lunch and still get back and work in the afternoon. This is somewhere i intend to get back to as soon as I can. It is just the right balance of informal atmosphere and fine food. Thanks for the reminder. I'd semi forgotten about this place but this brings back memories of an excellent and good value set lunch! It's a bit of a shame that 28-50 is just too far away for me to walk to. PS: Well jealous of those pig cheeks. @Mr Noodles - Basically tender pork wrapped in crisps. Fab fab combination. Sounds and looks like a great menu. Too bad about the brulée though - very few get it right. It all looks real purdy, another one to add to the ever expanding list of places to eat! @Miss Whiplash - The wine existed. @Pavel - Tasty as it looks too! So you leave the finesse of pig cheeks and end up with me eating beans beacon and burgers in a greasy spoon at Leadanhall Market. @Rachel at Catalan Cooking - Yes, look what I've been reduced to.